In my youth I was surrounded by Educators: both of my parents were teaching in Collages and Universities. Because of this I grew to know a number of professors who acted as if they knew everything, and to a youngster it seemed true. There were a number of occasions when at a social gathering of one sort of another I would overhear conversations between these giants of knowledge only to learn there were conflicts between their opinions as to what was “true”. After over hearing many of these over the years I became suspicious as to whether these human embodiments of Wisdom were actually fallible or not. Eventually I pulled my Father aside as asked him about it. “Well, Son (My Father considered me so bright, he called me “Son”) there are some who know and some who think they know and raise their voices to shout down their inner voices telling themselves they aren’t sure.” Hence forth, I usually took those who raise their voices in debate as folks who are busily trying to convince themselves they are right. In my adulthood I found a great number of “experts” who tend to voice a topic they either invented or hijacked and became authorities on the subject. I recall a friend of mine referring to these noble birds as “Boo Hoos” and thus the name stuck with me, it tended to become a reference to those who tend to make up stuff as they went along, rather than gleaning wisdom from a reliable source. When I was on the circuit (attending festivals, events and gatherings of all kinds) I came across a great number of folks who anointed themselves as “experts” on a variety of subjects, mostly Metaphysical and Spiritual, thus the term “Boo Hoo” wound up dressed in Robes and carrying various accoutrements of a noble station. Personally I was concerned because not only they, but a host of other people took them seriously. Much like the self made gurus of the ’60s and ’70s, these “Boo Hoos” became prevalent and nearly worshiped by the uninitiated and inexperienced. I was speechless. The melody was of a chant I was well familiar with, the words flowed out of him as if it was a well memorized incantation of Wisdom. I had no choice but to ask him his magical name (most Boo Hoos have magical names of one sort or another); and thus he spake unto me his sacred name The Great Sakima. I was floored, the song ringing in my ears ever since. This is a conformation of one’s Status. Obviously to truly know one’s self, one must face the inevitable. Alas for the Boo Hoo for the office of this sort is a troubled one. Let us examine the Holy Name: Boo Hoo. aside from the most obvious concept that to shout “BOO” to an unsuspecting chap may move one to a state of startled bewilderment; in Chinese the word “boo” translates “no”. In English, this rhymes with “Know” and as we may all agree that the synchronized connection is far too obvious to disclaim. However, if you truly wish to argue the point you are more that welcome to write your own chant. This is also a revelation that is connected through the language’s mysterious process of rhyming, a manifestation that may be observed through the holy ritual of the Sick Puppy. Hoo is then reviled to be “Who”. So then to place the concepts together then one may discover that a Boo Hoo is indeed an individual that Knows All, although the answer may not be available at the time. This point has been examined in the description above. I wish to note here that being all knowing doesn’t mean to know all and doesn’t mean that the Boo Hoo understands anything, hence the difference between knowledge and wisdom. This is the most frequent pass time of the Boo Hoo. It has been said often that if a Boo Hoo isn’t talking, chances are that the Boo Hoo isn’t breathing. This tends to make those that live in the holy presence to develop selected hearing loss. This is a Mystery of the Boo Hoo. In winter a Boo Hoo in good form has been known to warm entire buildings. Thus: the popularity of attending classes at universities and the full congregation in churches across the world in the colder seasons. Also, transversely many schools tend to close in the summer months due to the excessive heat. A rare occasion for the intelligent. Indeed, the process of tagging each and every Boo Hoo is a must to prevent the unsuspecting individual from placing too much weight of one’s world view with out thinking for one’s self. Sometimes referred to the Rush of the Boo Hoo. This is highly addictive and stimulating in large quantities. Highly recommended for all to experience as much as possible. This is the reaffirmation again. It is the true mark of a Boo Hoo to drive home a point by repeating one’s self, some times to the point of a drone. It has been often said that those who can’t do: teach (or become critics). Complaining is always a Boo Hoo’s first choice, but at times it is hard to tell the difference between the act of Teaching and the act of Complaining. Again, another mystery of the Boo Hoo. It is not necessary for a Boo Hoo to understand that which he/she is explaining. In order to be able to explain anything a Boo Hoo does not understand takes a bit of far fetched logic. One of the basic techniques of the Boo Hoo is if one can not quote a reliable source, make one up. This is an unfortunate by product of the Holy Babble. A most devastating experience for a Boo Hoo. A little knowledge is a dangerous thing, this can make a person such as a Boo Hoo a vary perilous individual. Many a Boo Hoo have self destruct with such an experience as this. Generally, a Boo Hoo must argue all points when faced with Truth. See: Inventing new Facts. A common manifestation of the Boo Hoo. There are some Boo Hoos that can read by their own countenance, a concept that can not be taken Lightly. Usually carrying weapons and instruments of torture. There are some Boo Hoos who have taken to making tours around the country to avoid these incidents. It takes a while for students to figure out that they have been bedazzled only to find the Boo Hoo gone to the next county. Long Tours and Short term Memories are the best combination. It has been said that a powerful Boo Hoo can make butter with the aide of such experiences. Remember, if you find yourself confronted with a suspected Boo Hoo, check for the caution sign. If you find one, they are probably harmless. It is the un-tagged ones that are the most dangerous! Both pleased and alarmed, I began to think about a counter measure against such silliness and decided to create special tags for Boo Hoos (see inspiration from the chant). The design was a simple one, the shape of a caution sign with the words “Boo Hoo” in the center. At first I thought it best to offer these to people who were self proclaimed Boo Hoos. I would hand them a flier and if they laughed, I suggested they “submit” (a term that often got somewhat of a shock, only to find I was asking them to write a special document that they made up about the Boo Hoos and become experts on the subject) but in fact I found this was asking too much and I placed the project on ice. As of late, I decide to re-ignite the Boo Hoo Amulet with a call to all who find themselves self made experts and wish to shout from the roof tops their wisdom and knowledge of (insert what ever here). And so, for your pleasure and gratification, I am not re-releasing the Boo Hoo Amulet. Wear with pride and honor, knowing your are what you make yourself to be and what you can convince others to believe. For Boo Hoos Everywhere. 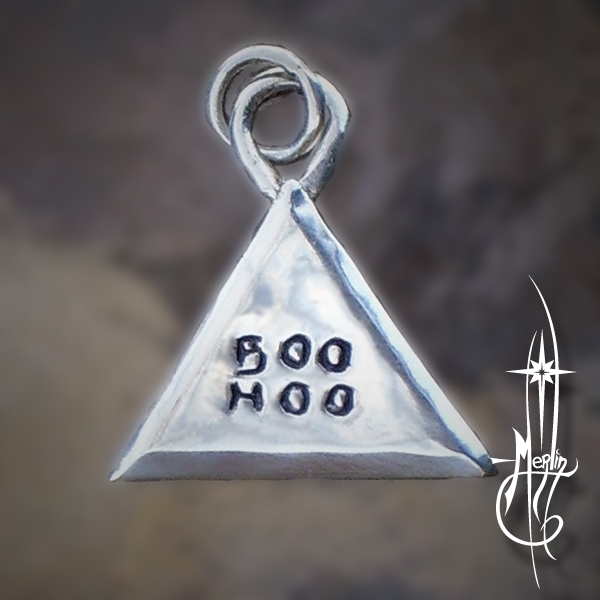 If you wish to get your own Boo Hoo Amulet, please go to my special Boo Hoo page in my site.